Although there are many facets to Lionel Messi's game, his goalscoring frequency is up there with the very best in the history of the game. His record in the Champions League is typically staggering, and over the last decade the Argentine and his chief rival Cristiano Ronaldo have consistently raised the bar by which others are measured. Messi has scored at least six Champions League goals for 12 consecutive seasons. The Barcelona man's most prolific campaign was 2011-12 (14). Messi owns the record for the most goals scored by a single player in the group stage (66). The Argentine has also notched more goals in the Round of 16 than any other player (26). 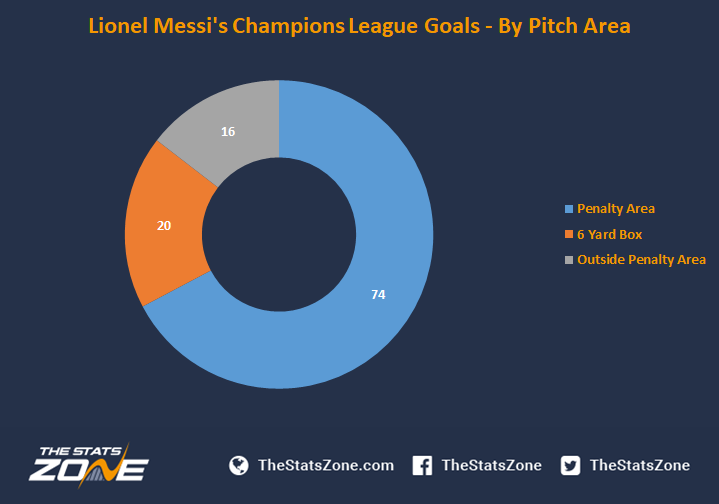 Two-thirds (67.3%) of Messi's Champions league strikes have come from inside the penalty area (not including 6 yard box goals). Just under a fifth (18.2%) have been scored from inside the 6 yard box. Messi's lethal left foot has accounted for 88 of his 110 Champions League goals (80.0%), considerably outweighing Ronaldo's ratio with his right foot. Messi has only scored four headers in the Champions League, although one of those was against Manchester United in the 2008/09 final. 85.5% of Messi's goals have come from open play, whilst he has reached double figures from the spot. 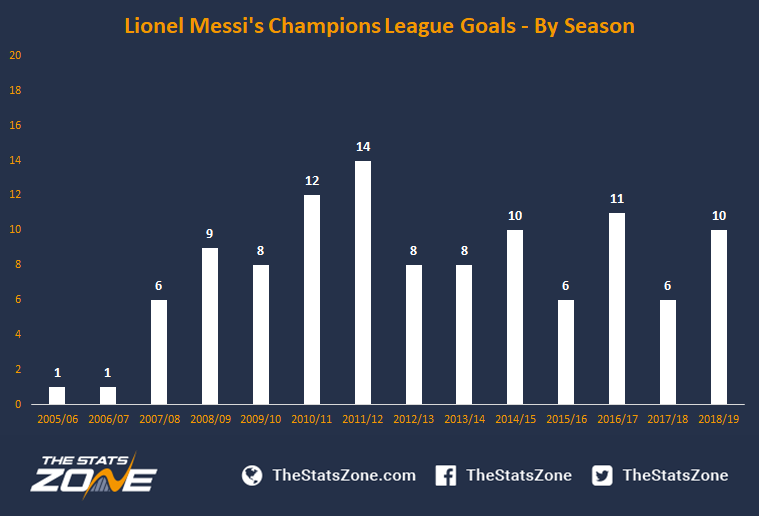 Surprisingly, Messi has only scored four free-kicks in his Champions League career. 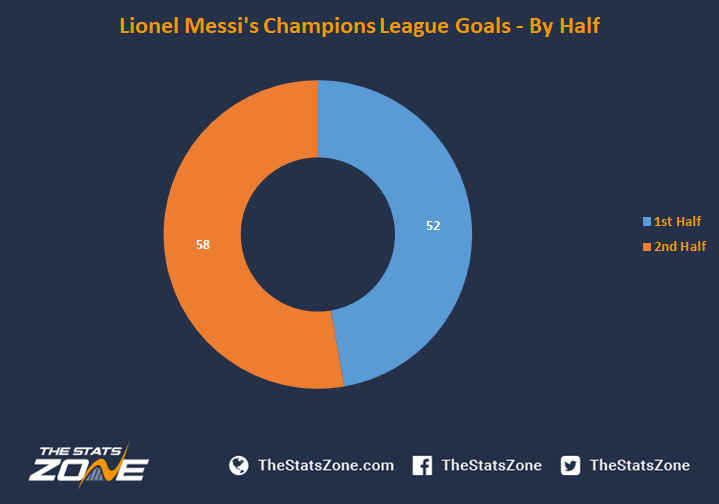 Messi has scored a slightly higher proportion of his Champions League goals in the second half of matches, with 52 coming before the break and 58 after. 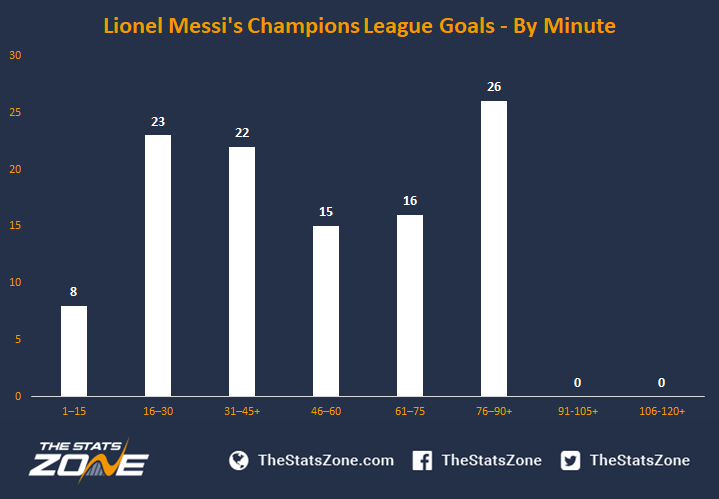 Two of Messi's top three most prolific time periods are at the end of each half, although it should be noted that these segments include injury time. 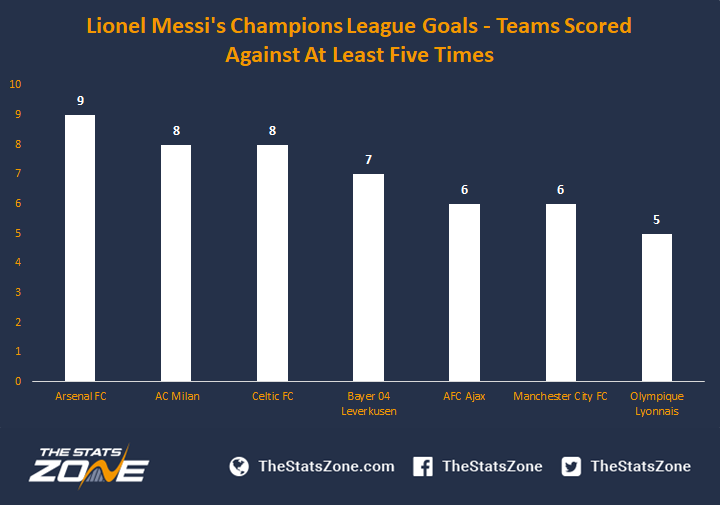 Messi has never featured in a Champions League match that has gone to extra-time. 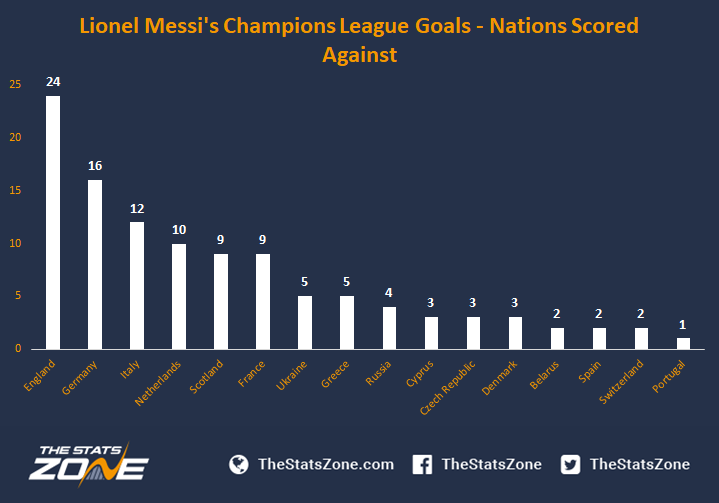 Clubs hailing from 16 different nations have been on the receiving end of a Messi goal in the Champions League. English and German teams have been notable victims of Messi over the years, with the Argentine scoring past clubs from those nations 24 and 16 times respectively. In terms of specific clubs, the Barcelona frontman has been on the scoresheet against 31 different opponents. Messi has scored at least five times against seven different clubs in the Champions League, three of those being British. Messi has scored past 47 different goalkeepers in the Champions League. 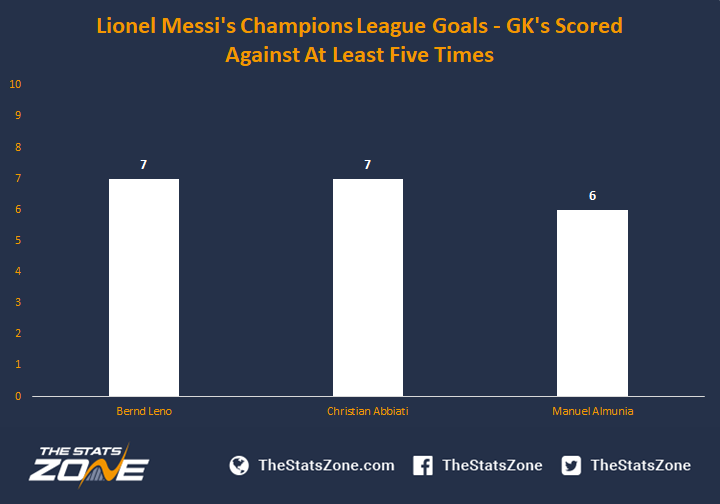 Bernd Leno and Christian Abbiati have the unfortunate distinction of conceding the most goals to Messi (seven). 24 different players have assisted Messi in the Champions league. 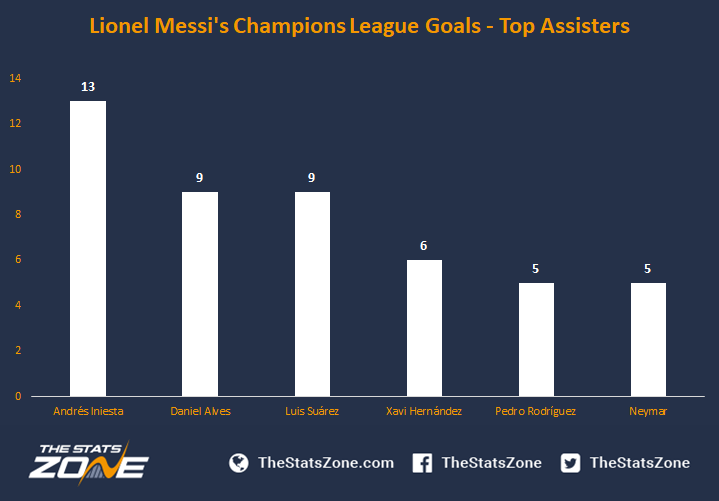 Andres Iniesta has been his most frequent supplier, with the Spaniard teeing up Messi for 13 goals in the competition. 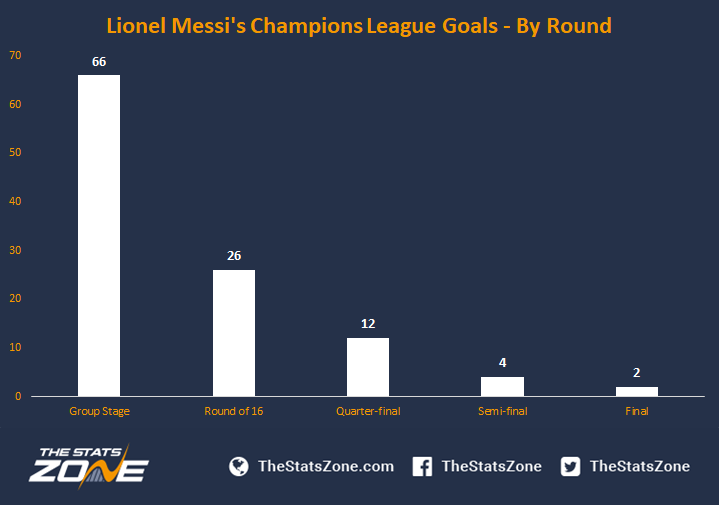 See how Lionel Messi's Champions League goalscoring record compares to that of Cristiano Ronaldo.